NEW! Check out these same rolls available in 74 foot rolls that now fit. 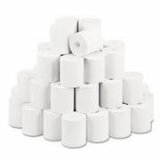 Fifty (50) new rolls of 2 1/4" x 50' thermal paper for contactless terminals. Vx520 or any terminal using 2 1/4" X 50' contactless thermal receipt rolls.